Chilean Metals Inc. (“Chilean Metals,” “CMX” or the “Company”) (TSXV:CMX, OTCQB:CMETF, SSE:CMX, MILA:CMX) has entered into an option to acquire the Economy East Exploration License which consists of 12 claims. Chilean Metals Inc. (“Chilean Metals,” “CMX” or the “Company”) (TSXV:CMX, OTCQB:CMETF, SSE:CMX, MILA:CMX) has entered into an option to acquire the Economy East Exploration License which consists of 12 claims. 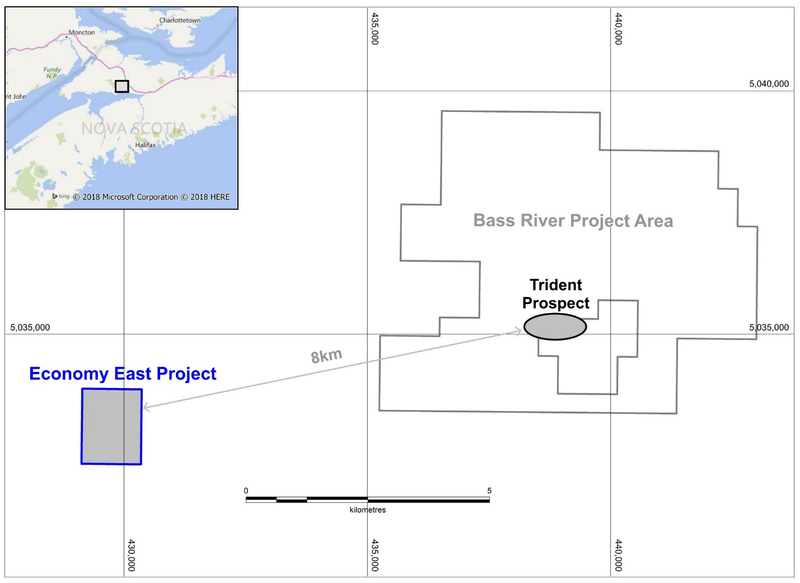 Economy East is located 8km west of our Trident Prospect in the Cobequid Highlands and is considered prospective for IOCG-Cobalt style mineralisation. In consideration for the Option, the CMX shall pay the Optionor as follows: (a) a cash payment of $12,000 to be paid within 10 working days of receiving TSX Venture Exchange (the “Exchange”) approval of this Agreement; (b) an issuance of common shares (the “Shares”) of the Optionee, having a value of $5,000 to the Optionor issuable within 10 working days of receiving Exchange approval of this Agreement; (c) a cash payment of $5,000 paid to the Optionor on or before the first anniversary of the Exchange approval and all subsequent years thereafter; and (d) incur, within 3 years from the date of Exchange approval of this Agreement, at least $500,000 in exploration expenditures on the Property, upon which the CMX will have earned its Interest in the Property, subject only to the 10% Free Carried Interest and the 1% NSR Royalty to be held by Optionor. CMX may purchase the 10% Free Carried Interest for $500,000 payable in cash or shares and it may acquire the 1% NSR Royalty by paying $250,000 in cash or shares. “We are very bullish on specific areas in the Cobequid Highlands and the potential for a major Cobalt and/or base metals discovery. We have recently completed drilling on our Castlereagh prospect in Bass River (Assays Pending Mid-Late July) and are completing a geophysical program over the recently acquired Trident Prospect where we will test later this summer a known Iron deposit, identified by Chilean Metals President Mick Sharry. Trident was the site of six core holes and a 1000 tonne bulk sample which were completed in the late 80’s. The bulk sample had noted interesting Cobalt results by the department of Natural Resources. We have submitted samples from that historic drill core for assay and will report on those when results are received. The Economy East project is interpreted to consist of very similar geology to Trident and as such is considered prospective for IOCG-Cobalt style mineralisation. We will conduct a detailed Airborne Mag and Radiometrics survey on the project. moving as quickly as possible to obtain land access agreements, cut lines and conduct an IP survey. Following that drill targets will be defined by integrating all available data and a drill program will be proposed. Click here to connect with Chilean Metals Inc. (TSXV:CMX, OTCQB:CMETF, SSE:CMX, MILA:CMX) for an Investor Presentation.